Three Morgan horses in the Portland, OR area are performing an important job; one they would never have dreamed of during their days by their mothers’ side. These horses are teaching children from the Portland and Vancouver Metropolitan areas life skills necessary to develop into responsible, caring adults. children’s charity located in Corbett, OR. This organization strives to offer “at risk” children, ages K-12, an opportunity to learn life skills through hands-on interactions with animals and nature in a therapeutic farm setting. 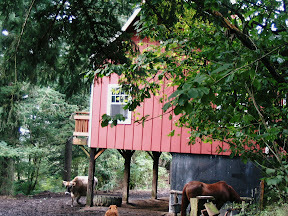 interact with farm animals such as chicken, goats, and horses. daughter), and “Kirby”(Fircrest Raleigh, a U.V.M. Promise grandson). 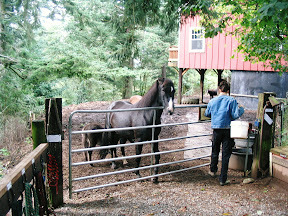 According to Stephanie, while the kids love all the animals, the horses are always the favorite. Riding is part of the program but that is not the main emphasis. The kids are taught every aspect of handling the horses in effort to teach them to communicate and read the body language of the horse with which they are working. Through these interactions, Stephanie sees many positive changes in the children. These changes include improvement in such areas as self esteem, confidence,attentiveness, communication skills, empathy, sense of accomplishment, and responsibility. It is definitely good mental therapy for all involved.